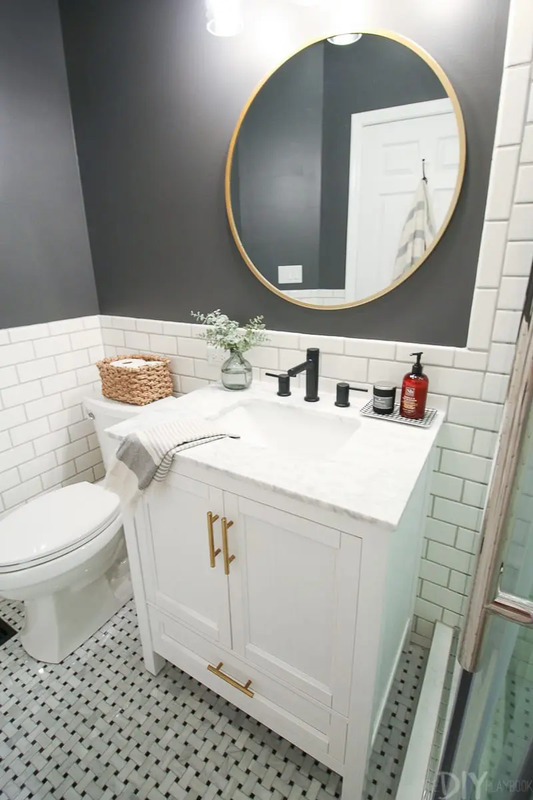 Last week, I showed you how I’ve been working hard to fill all of the nail holes in our rental. 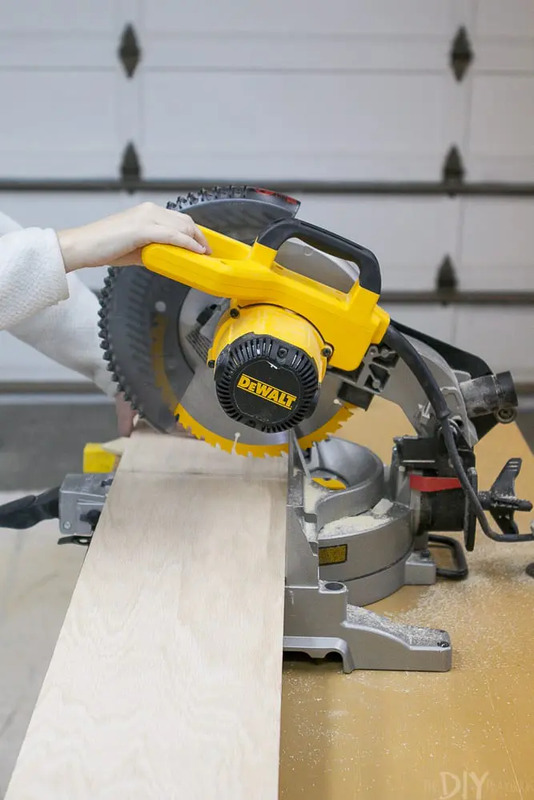 This week, we’re taking the DIY up a notch to tackle bigger holes. I’ve had to use anchors in a few spots around our home, to hold heavier items securely on the wall. Now that we’re packing everything up, those pretty picture ledges and shelves are off the walls, and big ugly holes are left in their place. If your holes aren’t very big, then last week’s tutorial on filling holes should work just fine. 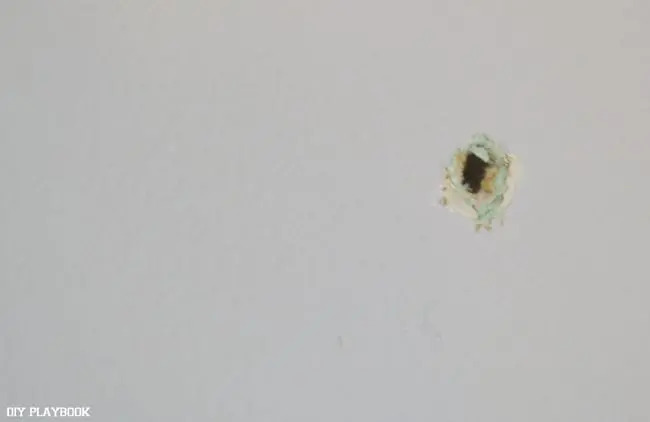 But today I want to show you how to repair larger holes in the wall. Let’s get things looking good as new! 1. 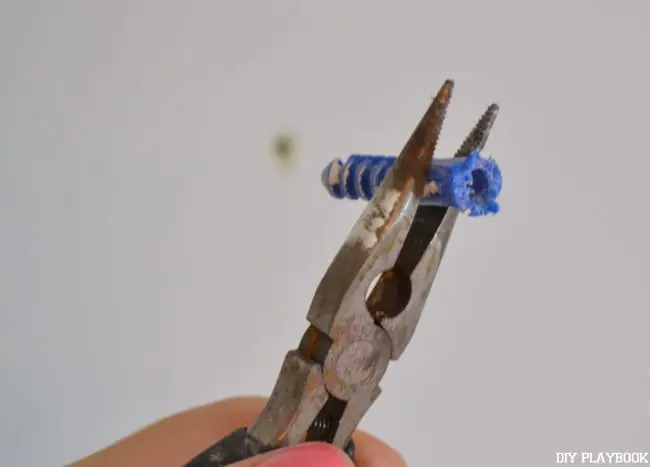 Take the item off your wall, and remove the screw that’s inserted into the anchor using either a screwdriver or a drill. Then you’ll be left with an anchor in the wall. 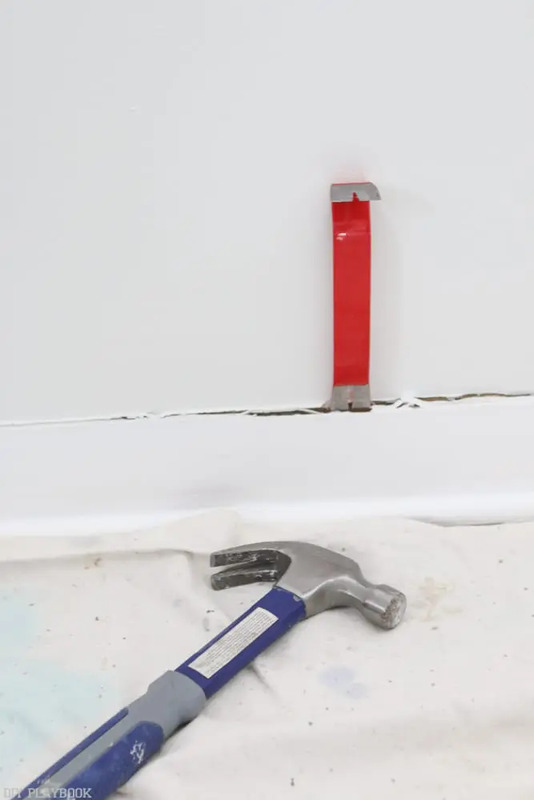 You may be able to pull the anchor out of the wall fairly easily. If not, pliers come in handy to get it out of there. 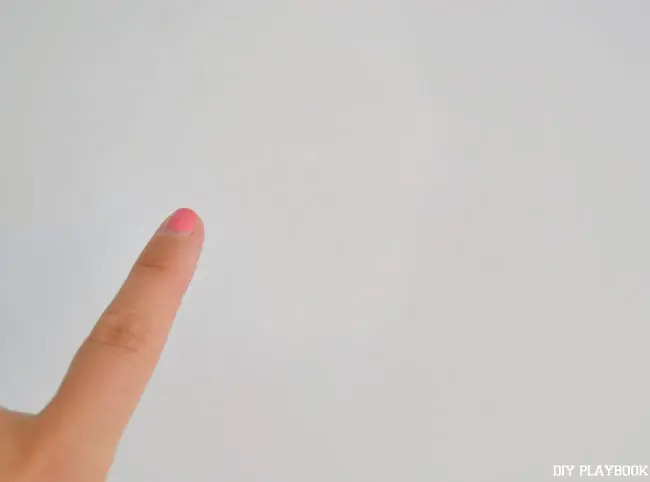 If you can’t get it out, try pushing it the other way so it falls into the wall. Either way, get it out of the wall so you’re left with a clean hole. 2. 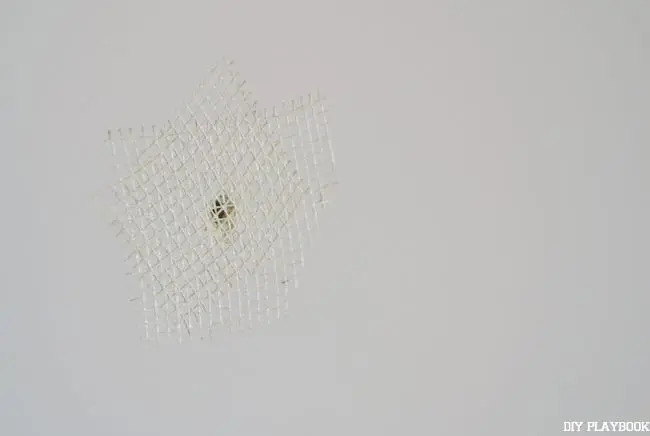 Now we’re gonna use something called mesh tape. 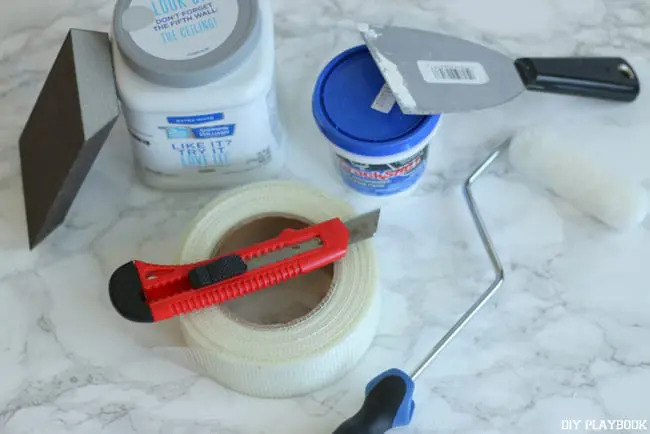 You can pick up a roll at any hardware store for just a few bucks. 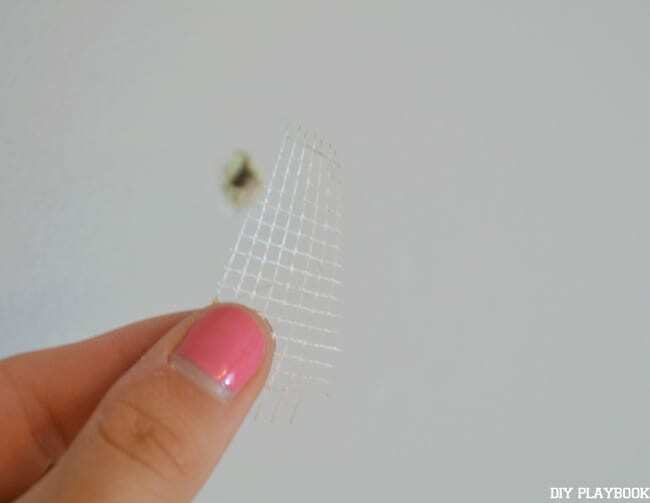 Take a razor blade and cut off 2 small pieces of the mesh tape. 3. 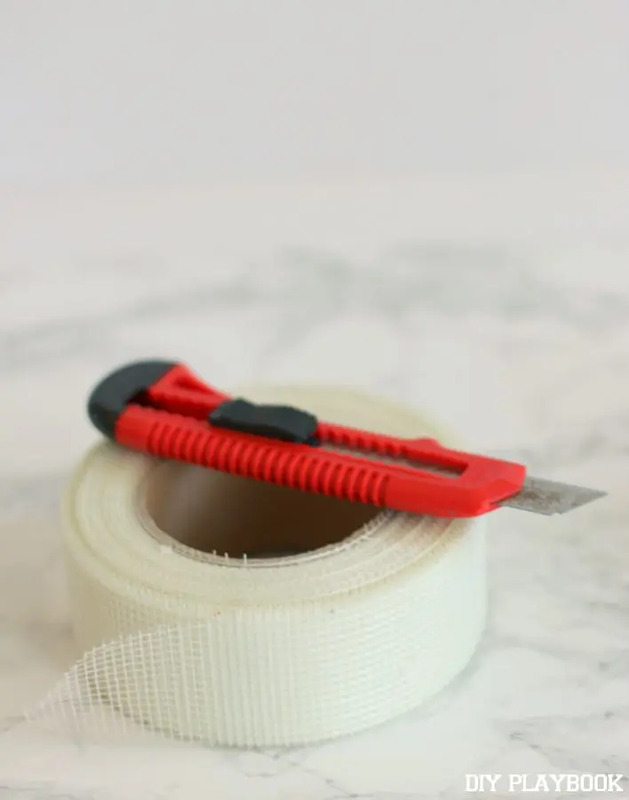 Take the tape and apply it to the wall. You’ll want your 2 pieces to overlap so you get a firm, flat surface. 4. 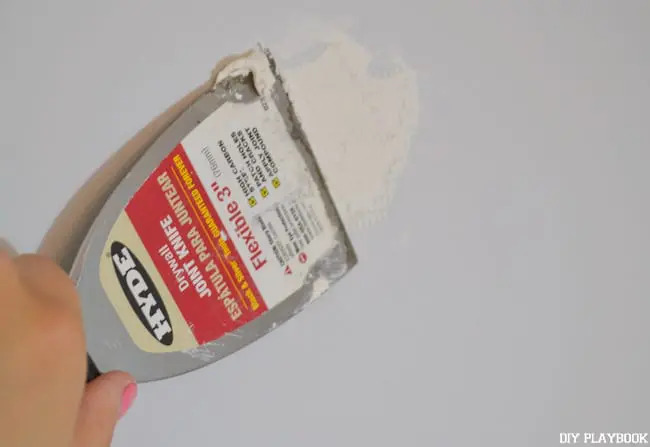 Next, take your spackle or joint compound and apply it over the tape. Be sure to put a LIGHT coat on and feather out to the edges. Remember you want everything to be flat, so try to get it nice and smooth. Let this dry (according to the directions on your spackle) and then put on 1-2 more light coats. 5. When your wall is dry, the hole is covered, and you can no longer see the mesh tape marks…you’re ready to sand. 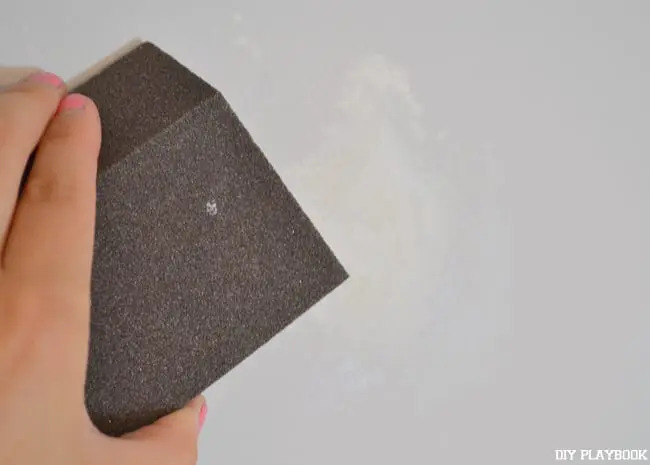 Use a sanding block and gently sand the wall until it’s smooth. 6. Now it’s time to prime & paint! 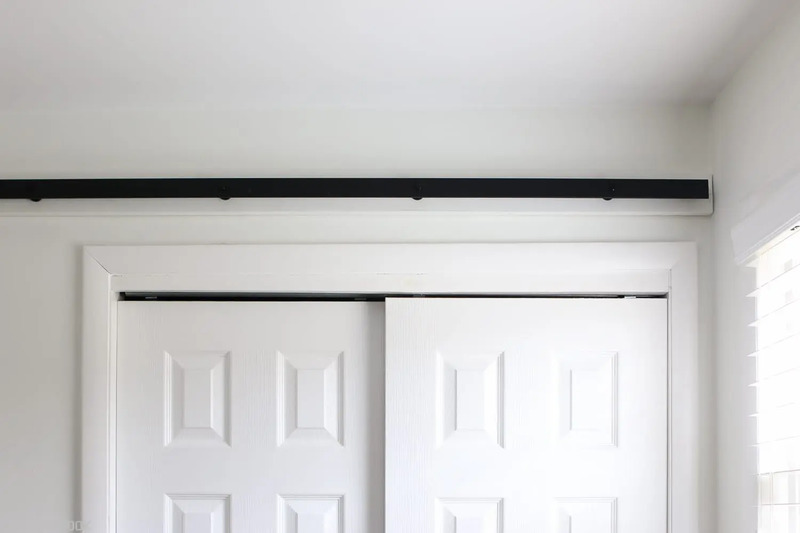 Put a light coat of primer on the area and allow that to dry overnight. Then use a small roller to put a light coat of paint onto the area. 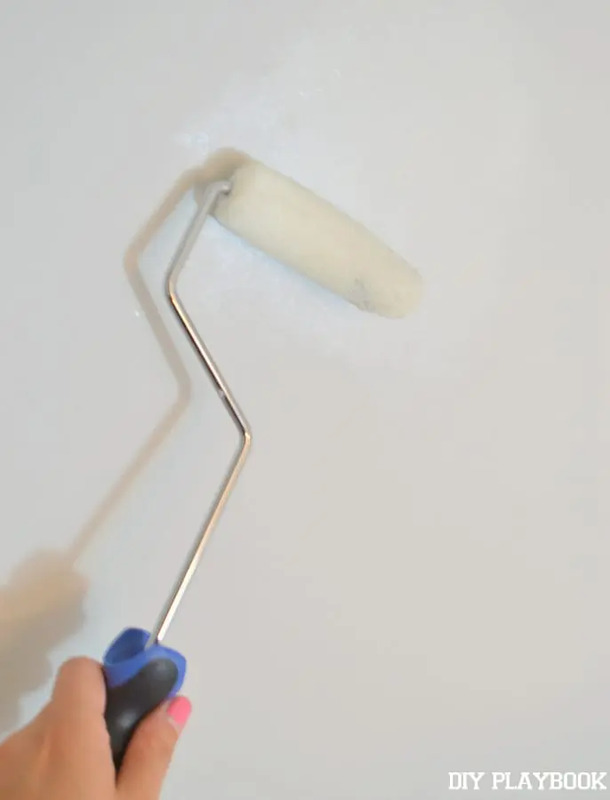 Be sure to use the exact color & sheen that you used to paint the walls the first time around. 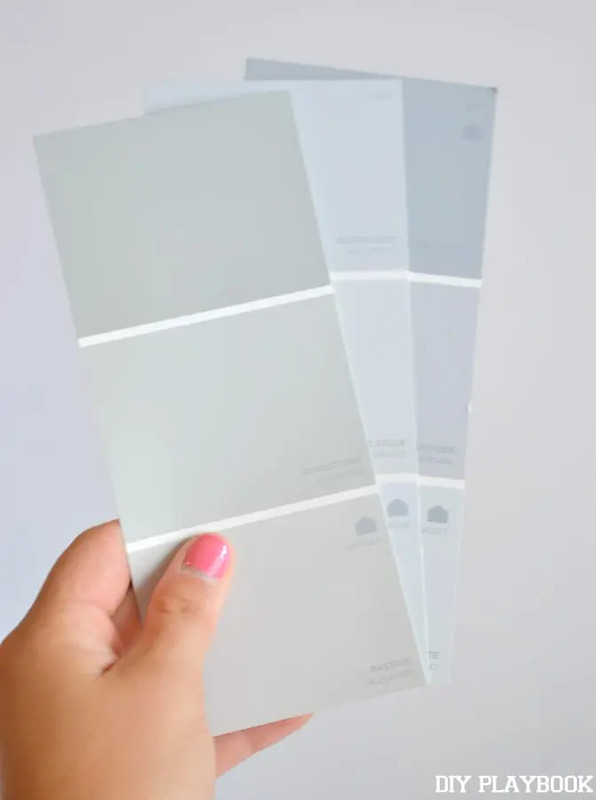 If you’re out of paint, just visit your hardware store and have them get you a small paint sample of the exact color. It will cost you less than $5 and you’ll know that the color & sheen will match perfectly. Look, the hole is gone! 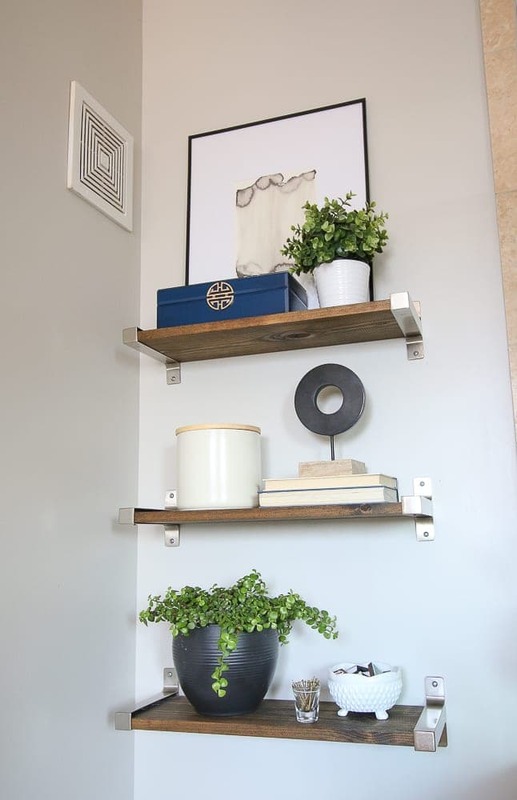 You (& your landlord) will quickly forget that shelves used to hang from this very wall.